The ultimate all-you-need-to-know guide to going vegan in a month – including 100 recipes, shopping lists and much more. 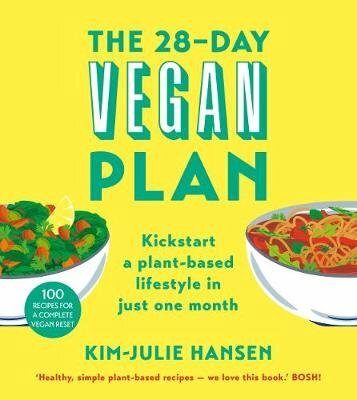 Food writer and blogger Kim-Julie Hansen presents a simple monthly plan that makes it easy to become a vegan. Laid out day by day with meal plans, advance prep, shopping lists, recipes and practical advice, this is the definitive guide for anyone interested in a plant-based lifestyle. If you want to go vegan but don’t know where to start, this includes everything you need. But it’s also invaluable for anyone looking to feel healthier, pack lots of veg into their diet and be more environmentally friendly. Thanks to incredible recipes such as Black Bean Tacos, Butternut Mac ‘n’ Cheese and Blueberry–Banana Ice Cream, The 28-Day Vegan Plan will get you craving plant-based meals long after the first month.